It may have been Matteo Trentin (Quickstep) who opened the sprint to the line in Kuurne, but it was Peter Sagan (Bora-Hansgrohe) who finished it out. He had the speed and the time to look behind, just making sure that neither Jasper Stuyven (Trek-Segafredo) nor Luke Rowe (Sky) were closing in. Sagan claimed the win after being disappointed with his second place finish yesterday. 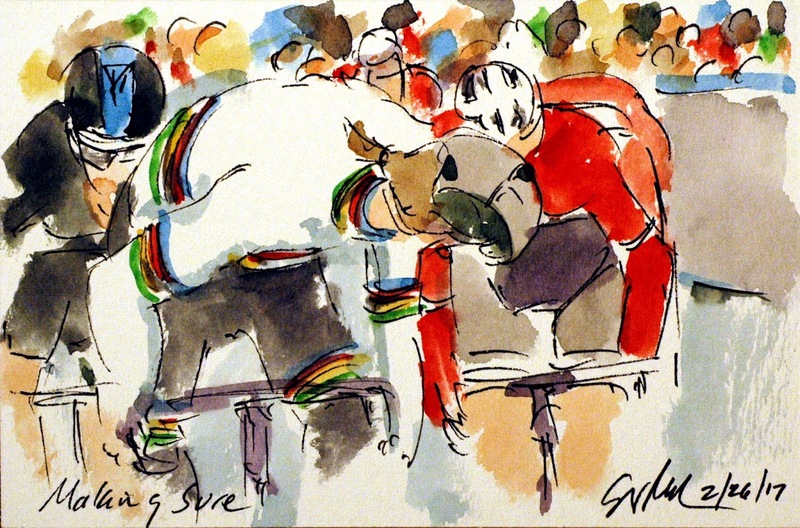 Sagan seems to have never been affected by the "curse of the Rainbow Jersey;" Stuyven had to settle for one step lower on the podium than 2016, and Luke Rowe finished the day in third. 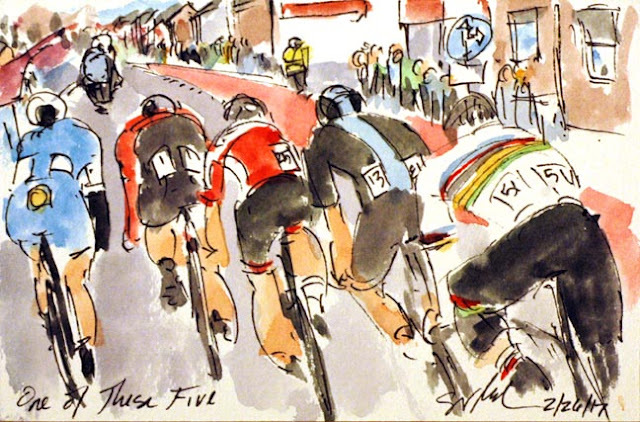 The original five just managed to stay in front of the chasers, and they in turn just held on ahead of the peloton. With the red kite marking the final kilometer of the race in the distance, Peter Sagan (Bora-Hansgrohe) looked over those off the front with him. Sagan was not in the best position to launch an attack, but the others, Tiesj Benoot (Lotto Soudal), Luke Rowe (Sky), Jasper Stuyven (Trek Segafredo) and Matteo Trentin (Quickstep), weren't about to hand any advantage to the two time Road World Champion. 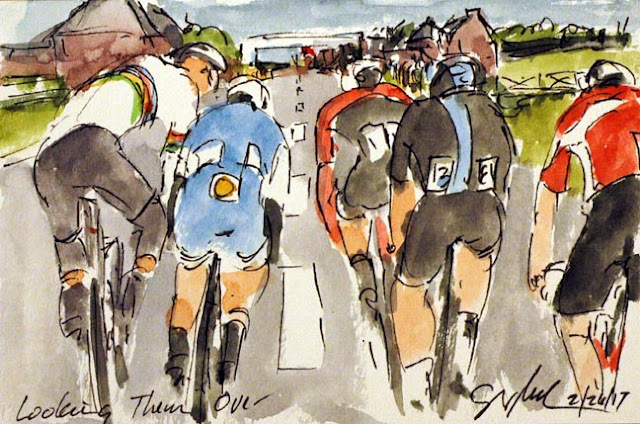 While jocking for position, the quintet risked slowing enough to let the chasing peloton sweep them up thus dashing all of their chances for claiming victory. It was these five very talented riders who managed to ride away from everyone else on the road. The group included the Rainbow Jersey of Peter Sagan (Bora-Hansgrohe), Luke Rowe (Sky), Tiesj Benoot (Lotto Soudal), Matteo Trentin (Quickstep) and the winner twelve months ago, Jasper Stuyven (Trek Segafredo). They have 36 seconds on the chasing group, which in turn has a minute on the peloton. Given that there are only 13 kilometers left to race, it is relatively safe to assume that the winner of the 2017 Kuurne-Brussels-Kuurne will be one of these five men. I have had the pleasure of riding in parts of Europe, so I quickly recognized the red bike lane just to the right of the racers. My home town is trying to catch up with this kind of cycling infrastructure, but we may have a way to go. The last four members of the early break, Jurgen Roelandts (Lotto Soudal), Antoine Duchesne (Direct Energie), Alexis Gougeard (Ag2r La Mondiale) and Maxime Farazijn (Sport Vlaanderen - Baloise), simply refuse to sit up and wait for the chasers behind. The foursome held off their captures for over twenty kilometers hovering around 15 seconds gap between the two groups. Finally, the strong legs behind over came the resolve of the tired ones of the break away compatriots. 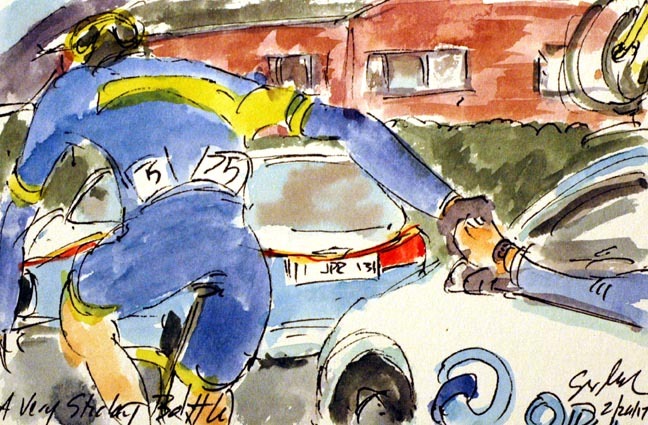 The title of this painting refers to the trick of the sport director holding onto the bottle longer than is necessary to give his rider a boost. The race directors can dock time if they deemed the act provided an advantage to the racer, they can even disqualify them from the race. Luke Durbridge (Orica-Scott) may have held on too long, but it did nothing to help in gain an unfair advantage. With a day of over 200 kilometers of racing in the cold, I am sure all of those out on their bikes were hoping for a rest of any sort. 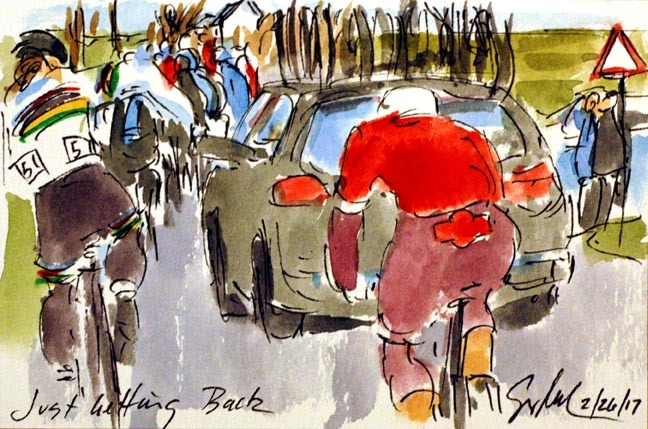 While Peter Sagan (Bora-Hansgrohe) busied himself loading up on drinks and energy bars, Baptiste Planckaert (Katusha) managed to catch back up with the chasing group of favorites. Planckaert had crashed with his teammate Tony Martin and another rider, neither of whom were able to rejoin the business end of the race. The constant turns, short climbs and sections of pave had split the peloton into numerous groups, With a break away of roughly eight guys up the road, it was the second group of twenty that held most of the favorites. 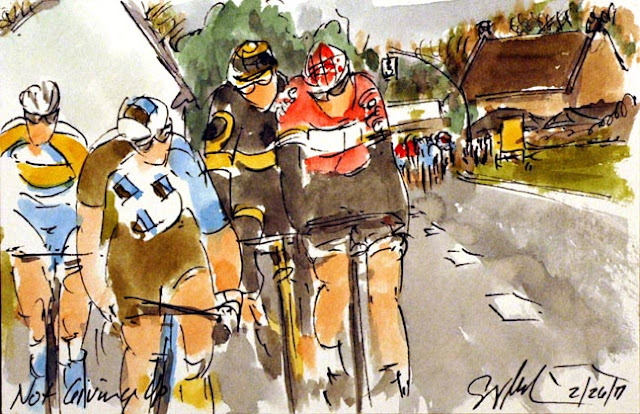 At this point, they were being lead by Tony Martin (Katusha) sporting his new team colors, coincidentally, it was his former teammate, Dries Devenyns (Quickstep) who had just swung of the front to let Martin pull the peloton along. 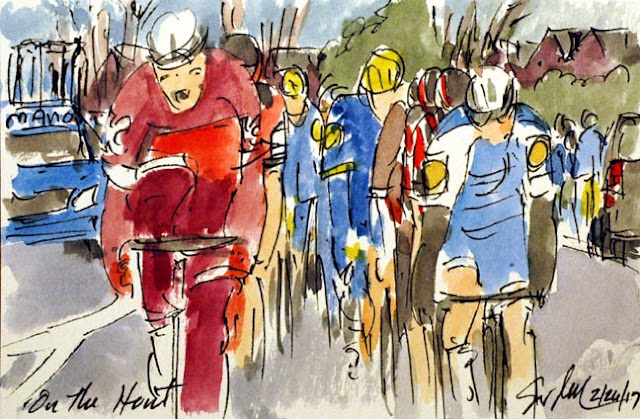 Unfortunately, Martin crashed shortly after I painted this, skinning his face on the asphalt, and dropping back into the following peloton. His crashed was caused by the forming echelon and the crowd of riders trying to find shelter from the wind. After racing below and near the equator, the peloton has now begun its campaign on the roads of northern Europe. 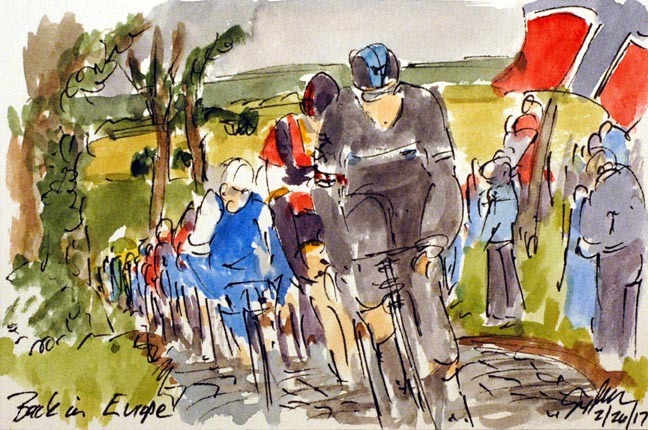 The riders face short steep climbs, many covered with pave and line with enthusiastic cold cycling fans cheering them on. With a traditional early break up the road, it fell to Ian Stannard (Sky) - followed by Greg Van Avermaet (BMC) - to pull the peloton along in pursuit across the roads of Belgium.